Are you planning to pilot or deploy Microsoft Intune and looking for straight forward technical guidance to help you accelerate these efforts? Please join the Intune Engineering Customer Acceleration Team as they share their extensive Intune implementation experience working with customers from all over the world. During this session the team will share their experiences, covering the end to end implementation process, from planning, architecture, deployment and management. At the end of this session you will have everything you will need to successfully deploy Intune in your environment, even if you have no prior knowledge or experience with Intune. Hi, could you share the slide deck please? Thanks! I'd also like to see a slide deck. 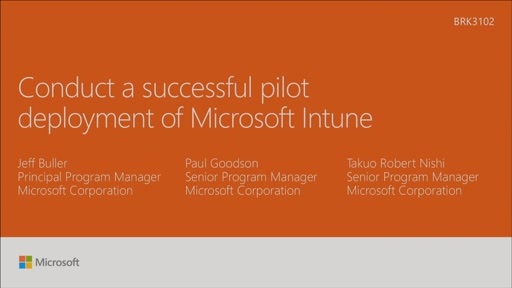 I have an Intune pilot engagement coming up and the slide deck would be helpful.